Nearly all cheesemaking requires the use of a coagulant. 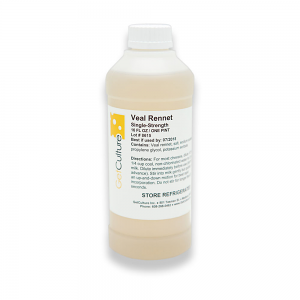 Natural coagulant comes from unweaned calves and is called rennet. An alternative to veal rennet is microbial coagulant, which is derived from Mucor miehei and is often referred to as vegetable or vegetarian rennet. 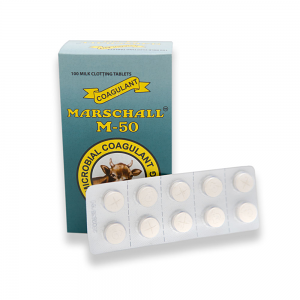 Coagulants are available in either liquid or tablet formats. Calcium chloride will boost the coagulation ability of your coagulant if you are using store-bought, highly pasteurized and/or homogenized milk. Liquid coagulants must be refrigerated and never frozen. Shelf-stable, non-animal-based microbial coagulant tablets for cheesemaking. Derived from mucor pusillus and/or mucor miehei. 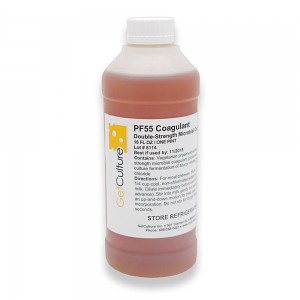 PF 55 Coagulant is the preservative-free version of Supreme Coagulant. Double-strength, non-animal-based microbial coagulant suitable for most organic applications. 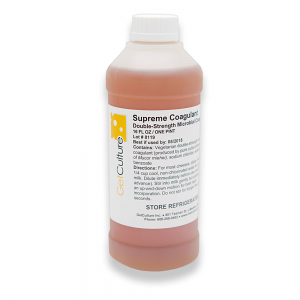 Supreme Coagulant is a double-strength, non-animal-based microbial coagulant.